Confession: my mom still fills my Christmas stocking. The toothbrush, the calendar, the gum, the handpicked ornament representing some highlight from the last 365 days? It's all still there in some way, shape or form. If we're together for the holiday, the "kids" still have to shut their eyes and wait for the stockings to be filled Christmas morning. If we're not, Mom mails a "stocking in a box:" all the treats that Santa would want in the stocking but delivered, and opened, before the official day (shh, don't tell Mom). Now I'm all for tradition, and I'm certainly not complaining about the treats that I do get because my mom is creative to no avail when it comes to stuffing these suckers year in and year out. But sometimes I wonder what else could be found in my stocking Christmas morning (I can still act like a kid on December 25, can't I?). 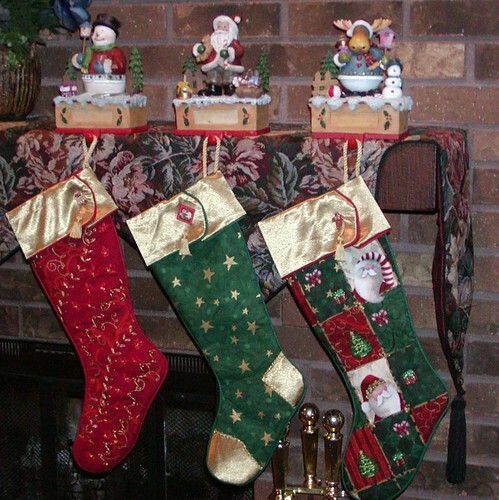 What if Mom were to stray from tradition and offer up a stocking with a running theme? A stocking is just a larger version of a sock, after all. And if that's the case, here are some picks to fill a runner's stocking come Christmas--or Secret Santa exchange, White Elephant party or Hanukkah. Feetures! socks. Any socks would fit into a stocking, but I'm currently digging my Feetures pair. They're soft and bright white--even after multiple washings--and they're holding up to the abuse I put most socks through. I'm always losing a sock in the wash, poking holes in their toes, or finding strays in my sock drawer. And what runner couldn't use a new pair of socks? Certainly not me. Nathan LED Strobe. It's small, it's battery-operated, it's easy to turn on and off, and it clips onto anything. With six blinking light varieties, it's perfect for calling attention to yourself when running or cycling, which can't be a bad thing when the days are shorter than the nights. signaling there's a runner on the path or a cyclist on the road. That is if drivers are paying attention. Gift card. This piece of plastic might seem like a cop-out when it comes to gift-giving any other time of the year, but not if you want to assure giving a gift that won't be returned on December 26. Small enough to slide into a stocking, but offering enough variety to customize as you see fit. Want to give music (iTunes) to update that overused running playlist, a new piece of running gear (from a favorite running store or brand), a cup o' joe (Starbucks) to perk up the morning of a race or after a long training run, a post-run smoothie (Jamba Juice) to get some nutrients back in the stomach after a hard workout? The possibilities are endless. Shot Bloks. Lately these Clif gummies have been my not-so-secret weapons on the marathon and triathlon courses--I'm addicted but hate shelling out the $2 per package. So finding these in my stocking, Tropical Punch-flavored please, would make me and my wallet happy. If Shot Bloks don't feed your fancy, there are always gels, Sport Beans, tablets and gummies to experiment with. Running-themed reading. Maybe it's a book, maybe it's training material, maybe it's a subscription (or renewal) to Runner's World, Women's Running or Running Times, to name a few. Whatever the case, it's something to think about running even when you're not out there doing it. Road ID. Tired of carrying half your wallet with you on the run or lack the pockets to do so? Here's a solution: Carry your personal information on your wrist with Road ID. It's like a WWJD band or LiveStrong bracelet that makes a statement except this time it's a personal one. Or take it one step further with Nathan's Vitaband, a wristband that acts as a personal and medical ID plus debit card. Gloves. Like socks, I'm always losing these handwarmers so I buy the $1 stretchy pairs you can often find at marathon expos or the drug store. They're nothing fancy, but they make so much difference to keep the digits warm on a cold run. A hat or headband works, too. iPod Shuffle. Want more a big-ticket item inside that stocking? I'd go iPod shuffle all the way. It's under $50, it's compact and it carries tunes to pass the run time. And sometimes you just need a little pick-me-up, especially in winter. Garmin watch. Whether it's the 310XT, the 405, the FR60 or any other Garmin device that's caught your eye of late, surprise your runner with a new watch to track those distances and log the run results. They might turn you into a data geek just yet. Three other options: Adidas micoach, Nike+ SportWatch GPS, Nike+ SportBand. Sport-Wash. Maybe you have a couple of one-wash packets of this Penguin product from the last fun run or race that you did. Rather than save it for yourself, you could always re-gift the sample to another runner to try on his or her running clothes. Runner ornament. For as long as I can remember, Christmases have always included at least one themed ornament--sports, travel, hobbies--to add to the tree decorations. I've acquired running shoes, skiers, a swimmer, bike parts--and that's only recounting a handful in my collection. Search "runner ornament" and you're all set, perhaps with this Boston Marathon runner. What are your favorite running-related stocking stuffers? Photo grabbed from hammer51012 at flickr. This is definitely a fantastic idea for my husband..I always struggle to fill his stocking but a running themed one would be something he would really love. Thank you for the inspiration! You're welcome! Thanks for reading, too. If you do go with the running theme, I'd love to hear what you ended up including. Happy holidays!